In view of the revolt of the Bolsheviki, and their attempt to depose the Provisional Government and to seize the power in Petrograd— the Cossack Government declares that it considers these acts criminal and absolutely inadmissible. In consequence, the Cossacks will lend all their support to the Provisional Government, which is a government of coalition. Because of these circumstances, and until the return of the Provisional Government to power, and the restoration of order in Russia, I take upon myself, beginning November 7th, all the power in that which concerns the region of the Don. President of the Government of the Cossack Troops. I, Minister-President of the Provisional Government, and Supreme Commander of all the armed forces of the Russian Republic, declare that I am at the head of regiments from the Front who have remained faithful to the fatherland. I order all the troops of the Military District of Petrograd, who through mistake or folly have answered the appeal of the traitors to the country and the Revolution, to return to their duty without delay. This order shall be read in all regiments, battalions and squadrons. The town of Gatchina has been taken by the loyal regiments without bloodshed. Detachments of Cronstadt sailors, and of the Semionovsky and Ismailovsky regiments, gave up their arms without resistance and joined the Government troops. I order all the designated units to advance as quickly as possible. The Military Revolutionary Committee has ordered its troops to retreat…. Gatchina, about thirty kilometers south-west, had fallen during the night. Detachments of the two regiments mentioned—not the sailors—while wandering captainless in the neighbourhood, had indeed been surrounded by Cossacks and given up their arms; but it was not true that they had joined the Government troops. At this very moment crowds of them, bewildered and ashamed, were up at Smolny trying to explain. They did not think the Cossacks were so near…. They had tried to argue with the Cossacks…. Apparently the greatest confusion prevailed along the revolutionary front. The garrisons of all the little towns southward had split hopelessly, bitterly into two factions—or three: the high command being on the side of Kerensky, in default of anything stronger, the majority of the rank and file with the Soviets, and the rest unhappily wavering. Hastily the Military Revolutionary Committee appointed to command the defence of Petrograd an ambitious regular Army Captain, Muraviov, the same Muraviov who had organised the Death Battalions during the summer, and had once been heard to advise the Government that “it was too lenient with the Bolsheviki; they must be wiped out.” A man of military mind, who admired power and audacity, perhaps sincerely…. Beside my door when I came down in the morning were posted two new orders of the Military Revolutionary Committee, directing that all shops and stores should open as usual, and that all empty rooms and apartments should be put at the disposal of the Committee…. For thirty-six hours now the Bolsheviki had been cut off from provincial Russia and the outside world. The railway men and telegraphers refused to transmit their despatches, the postmen would not handle their mail. Only the Government wireless at Tsarskoye Selo launched half-hourly bulletins and manifestoes to the four corners of heaven; the Commissars of Smolny raced the Commissars of the City Duma on speeding trains half across the earth; and two aeroplanes, laden with propaganda, fled high up toward the Front…. But the eddies of insurrection were spreading through Russia with a swiftness surpassing any human agency. Helsingfors Soviet passed resolutions of support; Kiev Bolsheviki captured the arsenal and the telegraph station, only to be driven out by delegates to the Congress of Cossacks, which happened to be meeting there; in Kazan, a Military Revolutionary Committee arrested the local garrison staff and the Commissar of the Provisional Government; from far Krasnoyarsk, in Siberia, came news that the Soviets were in control of the Municipal institutions; at Moscow, where the situation was aggravated by a great strike of leather-workers on one side, and a threat of general lock-out on the other, the Soviets had voted overwhelmingly to support the action of the Bolsheviki in Petrograd…. Already a Military Revolutionary Committee was functioning. Everywhere the same thing happened. The common soldiers and the industrial workers supported the Soviets by a vast majority; the officers, yunkers and middle class generally were on the side of the Government—as were the bourgeois Cadets and the “moderate” Socialist parties. In all these towns sprang up Committees for Salvation of Country and Revolution, arming for civil war…. Vast Russia was in a state of solution. As long ago as 1905 the process had begun; the March Revolution had merely hastened it, and giving birth to a sort of forecast of the new order, had ended by merely perpetuating the hollow structure of the old regime. Now, however, the Bolsheviki, in one night, had dissipated it, as one blows away smoke. Old Russia was no more; human society flowed molten in primal heat, and from the tossing sea of flame was emerging the class struggle, stark and pitiless—and the fragile, slowly-cooling crust of new planets…. In Petrograd sixteen Ministries were on strike, led by the Ministries of Labour and of Supplies—the only two created by the all-Socialist Government of August. As we came down the Nevsky a little after midday the whole street before the Duma building was crowded with people. Here and there stood Red Guards and sailors, with bayonetted rifles, each one surrounded by about a hundred men and women—clerks, students, shopkeepers, tchinovniki—shaking their fists and bawling insults and menaces. On the steps stood boy-scouts and officers, distributing copies of the Soldatski Golos. A workman with a red band around his arm and a revolver in his hand stood trembling with rage and nervousness in the middle of a hostile throng at the foot of the stairs, demanding the surrender of the papers…. Nothing like this, I imagine, ever occurred in history. On one side a handful of workmen and common soldiers, with arms in their hands, representing a victorious insurrection—and perfectly miserable; on the other a frantic mob made up of the kind of people that crowd the sidewalks of Fifth Avenue at noon-time, sneering, abusing, shouting, “Traitors! Provocators! Opritchniki! The doors were guarded by students and officers with white arm-bands lettered in red, “Militia of the Committee of Public Safety,” and half a dozen boy-scouts came and went. Upstairs the place was all commotion. Captain Gomberg was coming down the stairs. “They’re going to dissolve the Duma,” he said. “The Bolshevik Commissar is with the Mayor now.” As we reached the top Riazanov came hurrying out. He had been to demand that the Duma recognise the Council of peoples’ Commissars, and the Mayor had given him a flat refusal. In the offices a great babbling crowd, hurrying, shouting, gesticulating—Government officials, intellectuals, journalists, foreign correspondents, French and British officers…. “The City Engineer pointed to them triumphantly. “The Embassies recognise the Duma as the only power now,” he explained. “For these Bolshevik murderers and robbers it is only a question of hours. All Russia is rallying to us…. “…. The power of the Soviets is not democratic power, but a dictatorship—and not the dictatorship of the proletariat, but against the proletariat. All those who have felt or know how to feel revolutionary enthusiasm must join now for the defence of the Revolution…. “The problem of the day is not only to render harmless irresponsible demagogues, but to fight against the counter-revolution…. If rumours are true that certain generals in the provinces are attempting to profit by events in order to march on Petrograd with other designs, it is only one more proof that we must establish a solid base of democratic government. Otherwise, troubles with the Right will follow troubles from the Left…. “The garrison of Petrograd cannot remain indifferent when citizens buying the Golos Soldata and newsboys selling the Rabotchaya Gazeta are arrested in the streets…. “The hour of resolutions has passed…. Let those who have no longer faith in the Revolution retire…. To establish a united power, we must again restore the prestige of the Revolution…. The hall rose, cheering, with kindling eyes. There was not a single proletarian anywhere in sight…. The Vikzhel representative announced that his organisation was taking the initiative in forming the new Government, and its delegates were now discussing the matter with Smolny…. Followed a hot discussion: were the Bolsheviki to be admitted to the new Government? Martov pleaded for their admission; after all, he said, they represented an important political party. Opinions were very much divided upon this, the right wing Mensheviki and Socialist Revolutionaries, as well as the Populist Socialists, the Cooperatives and the bourgeois elements being bitterly against…. Skobeliev was in favor of excluding both the Bolsheviki and the Cadets. We got into conversation with a young Socialist Revolutionary, who had walked out of the Democratic Conference to gether with the Bolsheviki, that night when Tseretelli and the “compromisers” forced Coalition upon the democracy of Russia. “You here?” I asked him. I asked if it were true that Kaledin was marching north. Outside there was a shot. We ran to the windows. A Red Guard, finally exasperated by the taunts of the crowd, had shot into it, wounding a young girl in the arm. We could see her being lifted into a cab, surrounded by an excited throng, the clamour of whose voices floated up to us. As we looked, suddenly an armoured automobile appeared around the corner of the Mikhailovsky, its guns sluing this way and that. Immediately the crowd began to run, as Petrograd crowds do, falling down and lying still in the street, piled in the gutters, heaped up behind telephone-poles. The car lumbered up to the steps of the Duma and a man stuck his head out of the turret, demanding the surrender of the Soldatski Golos. The boy-scouts jeered and scuttled into the building. After a moment the automobile wheeled undecidedly around and went off up the Nevsky, while some hundreds of men and women picked themselves up and began to dust their clothes…. Inside was a prodigious running-about of people with armfuls of Soldatski Golos, looking for places to hide them…. A journalist came running into the room, waving a paper. By the order of the Supreme Commander I am appointed commandant of the troops concentrated under Petrograd. Citizens, soldiers, valorous Cossacks of the Don, of the Kuban, of the Transbaikal, of the Amur, of the Yenissei, to all you who have remained faithful to your oath I appeal; to you who have sworn to guard inviolable your oath of Cossack—I call upon you to save Petrograd from anarchy, from famine, from tyranny, and to save Russia from the indelible shame to which a handful of ignorant men, bought by the gold of Wilhelm, are trying to submit her. The Provisional Government, to which you swore fidelity in the great days of March, is not overthrown, but by violence expelled from the edifice in which it held its meetings. However the Government, with the help of the Front armies, faithful to their duty, with the help of the Council of Cossacks, which has united under its command all the Cossacks and which, strong with the morale which reigns in its ranks, and acting in accordance with the will of the Russian people, has sworn to serve the country as its ancestors served it in the Troublous Times of 1612, when the Cossacks of the Don delivered Moscow, menaced by the Swedes, the Poles, and the Lithuanians. Your Government still exists…. The active army considers these criminals with horror and contempt. Their acts of vandalism and pillage, their crimes, the German mentality with which they regard Russia—stricken down but not yet surrendered—have alienated from them the entire people. Citizens, soldiers, valorous Cossacks of the garrison of Petrograd; send me your delegates so that I may know who are traitors to their country and who are not, that there may be avoided an effusion of innocent blood. Almost the same moment word ran from group to group that the building was surrounded by Red Guards. An officer strode in, a red band around his arm, demanding the Mayor. A few minutes later he left and old Schreider came out of his office, red and pale by turns. “I don’t know—going to arrest us—going to dissolve the Duma—arresting members at the door—” so ran the excited comments. In the Nicolai Hall there was barely room to stand. The Mayor announced that troops were stationed at all the doors, prohibiting all exit and entrance, and that a Commissar had threatened arrest and the dispersal of the Municipal Duma. A flood of impassioned speeches from members, and even from the galleries, responded. The freely-elected City Government could not be dissolved by any power; the Mayor’s person and that of all the members were inviolable; the tyrants, the provocators, the German agents should never be recognised; as for these threats to dissolve us, let them try—only over our dead bodies shall they seize this chamber, where like the Roman senators of old we await with dignity the coming of the Goths…. 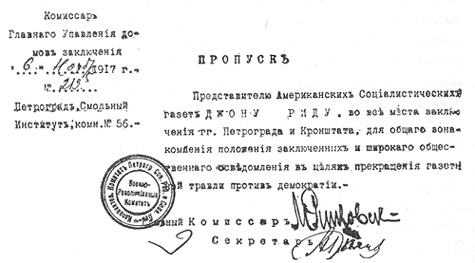 Resolution, to inform the Dumas and Zemstvos of all Russia by telegraph. Resolution, that it was impossible for the Mayor or the Chairman of the Duma to enter into any relations whatever with representatives of the Military Revolutionary Committee or with the so-called Council of People’s Commissars. Resolution, to address another appeal to the population of Petrograd to stand up for the defence of their elected town government. Resolution, to remain in permanent session…. In the meanwhile one member arrived with the information that he had telephoned to Smolny, and that the Military Revolutionary Committee said that no orders had been given to surround the Duma, that the troops would be withdrawn…. As we went downstairs Riazanov burst in through the front door, very agitated. “Are you going to dissolve the Duma?” I asked. “My God, no!” he answered. “It is all a mistake. I told the Mayor this morning that the Duma would be left alone…. Out on the Nevsky, in the deepening dusk, a long double file of cyclists came riding, guns slung on their shoulders. They halted, and the crowd pressed in and deluged them with questions. “Who are you? Where do you come from?” asked a fat old man with a cigar in his mouth. A little officer in a leather coat came running down the steps. “The garrison is turning!” he muttered in my ear. “It’s the beginning of the end of the Bolsheviki. Do you want to see the turn of the tide? Come on!” He started at a half-trot up the Mikhailovsky, and we followed. “The brunnoviki….” Here was indeed serious trouble. The brunnoviki were the Armoured Car troops, the key to the situation; whoever controlled the brunnoviki controlled the city. “The Commissars of the Committee for Salvation and the Duma have been talking to them. There’s a meeting on to decide…. The door of the great Mikhailovsky Riding-School yawned blackly. Two sentinels tried to stop us, but we brushed by hurriedly, deaf to their indignant expostulations. Inside only a single arc-light burned dimly, high up near the roof of the enormous hall, whose lofty pilasters and rows of windows vanished in the gloom. Around dimly squatted the monstrous shapes of the armoured cars. One stood alone in the centre of the place, under the light, and round it were gathered some two thousand dun-colored soldiers, almost lost in the immensity of that imperial building. A dozen men, officers, chairmen of the Soldiers’ Committees and speakers, were perched on top of the car, and from the central turret a soldier was speaking. This was Khanjunov, who had been president of last summer’s all-Russian Congress of Brunnoviki. A lithe, handsome figure in his leather coat with lieutenant’s shoulder-straps, he stood pleading eloquently for neutrality. This sounded reasonable—the great hall echoed to the crash of hands and voices. A soldier climbed up, his face white and strained, “Comrades!” he cried, “I came from the Rumanian front, to urgently tell you all: there must be peace! Peace at once! Whoever can give us peace, whether it be the Bolsheviki or this new Government, we will follow. Peace! We at the front cannot fight any longer. We cannot fight either Germans or Russians—” With that he leaped down, and a sort of confused agonised sound rose up from all that surging mass, which burst into something like anger when the next speaker, a Menshevik oboronetz, tried to say that the war must go on until the Allies were victorious. “You talk like Kerensky!” shouted a rough voice. A Duma delegate, pleading for neutrality. Him they listened to, muttering uneasily, feeling him not one of them. Never have I seen men trying so hard to understand, to decide. They never moved, stood staring with a sort of terrible intentness at the speaker, their brows wrinkled with the effort of thought, sweat standing out on their foreheads; great giants of men with the innocent clear eyes of children and the faces of epic warriors…. Now a Bolshevik was speaking, one of their own men, violently, full of hate. They liked him no more than the other. It was not their mood. For the moment they were lifted out of the ordinary run of common thoughts, thinking in terms of Russia, of Socialism, the world, as if it depended on them whether the Revolution were to live or die…. Speaker succeeded speaker, debating amid tense silence, roars of approval, or anger: should we come out or not? Khanjunov returned, persuasive and sympathetic. But wasn’t he an officer, and an oboronotz, however much he talked of peace? Then a workman from Vasili Ostrov, but him they greeted with, “And are you going to give us peace, working-man?” Near us some men, many of them officers, formed a sort of claque to cheer the advocates of Neutrality. They kept shouting, “Khanjunov! Khanjunov!” and whistled insultingly when the Bolsheviki tried to speak. Suddenly the committeemen and officers on top of the automobile began to discuss something with great heat and much gesticulation. The audience shouted to know what was the matter, and all the great mass tossed and stirred. A soldier, held back by one of the officers, wrenched himself loose and held up his hand. “Comrades!” he cried, “Comrade Krylenko is here and wants to speak to us.” An outburst of cheers, whistlings, yells of “Prosim! Prosim! Dolby! Go ahead! Go ahead! Down with him!” in the midst of which the People’s Commissar for Military Affairs clambered up the side of the car, helped by hands before and behind, pushed and pulled from below and above. Rising he stood for a moment, and then walked out on the radiator, put his hands on his hips and looked around smiling, a squat, short-legged figure, bare-headed, with-out insignia on his uniform. The claque near me kept up a fearful shouting, “Khanjunov! We want Khanjunov! Down with him! Shut up! Down with the traitor!” The whole place seethed and roared. Then it began to move, like an avalanche bearing down upon us, great black-browed men forcing their way through. “Who is breaking up our meeting?” they shouted. “Who is whistling here?” The claque, rudely burst asunder, went flying—nor did it gather again…. “Comrade soliders!” began Krylenko, in a voice husky with fatigue. “I cannot speak well to you; I am sorry; but I have not had any sleep for four nights…. “I don’t need to tell you that I am a soldier. I don’t need to tell you that I want peace. What I must say is that the Bolshevik party, successful in the Workers’ and Soldiers’ Revolution, by the help of you and of all the rest of the brave comrades who have of you and of all the rest of the brave comrades who have hurled down forever the power of the blood-thirsty bourgeoisie, promised to offer peace to all the peoples, and that has already been done—today!” Tumultuous applause. “You are asked to remain neutral—to remain neutral while the yunkers and the Death Battalions, who are never neutral, shoot us down in the streets and bring back to Petrograd Kerensky—or perhaps some other of the gang. Kaledin is marching from the Don. Kerensky is coming from the front. Kornilov is raising the Tekhintsi to repeat his attempt of August. All these Mensheviki and Socialist Revolutionaries who call upon you now to prevent civil war—how have they retained the power except by civil war, that civil war which has endured ever since last July, and in which they constantly stood on the side of the bourgeoisie, as they do now? While he spoke, he kept himself up by sheer evident effort of will, and as he went on the deep sincere feeling back of his words broke through the tired voice. At the end he totered, almost falling; a hundred hands reached up to help him down, and the great dim spaces of the hall gave back the surf of sound that beat upon him. Khanjunov tried to speak again, but “Vote! Vote! Vote!” they cried. At length, giving in, he read the resolution: that the brunnoviki withdraw their representative from the Military Revolutionary Committee, and declare their neutrality in the present civil war. All those in favour should go to the right; those opposed, to the left. There was a moment of hesitation, a still expectancy, and then the crowd began to surge faster and faster, stumbling over one another, to the left, hundreds of big soldiers in a solid mass rushing across the dirt floor in the faint light…. Near us about fifty men were left stranded, stubbornly in favour, and even as the high roof shook under the shock of victorious roaring, they turned and rapidly walked out of the building—and, some of them, out of the Revolution…. Imagine this struggle being repeated in every barracks of the city, the district, the whole front, all Russia. Imagine the sleepless Krylenkos, watching the regiments, hurrying from place to place, arguing, threatening, entreating. And then imaging the same in all the locals of every labour union, in the factories, the villages, on the battle-ships of the far-flung Russian fleets; think of the hundreds of thousands of Russian men staring up at speakers all over the vast country, workmen, peasants, soldiers, sailors, trying so hard to understand and to choose, thinking so intensely—and deciding so unanimously at the end. So was the Russian Revolution…. 1. The elections for the Constituent Assembly shall take place at the date determined upon—November 12. 2. All electoral commissions, organs of local self-government, Soviets of Workers’, Soldiers’ and Peasants’ Deputies, and soldiers’ organisations on the front should make every effort to assure free and regular elections at the date determined upon. In the Municipal building the Duma was in full blast. A member of the Council of the Republic was talking as we came in. The Council, he said, did not consider itself dissolved at all, but merely unable to continue its labours until it secured a new meeting-place. In the meanwhile, its Committee of Elders had determined to enter en masse the Committee for Salvation…. This, I may remark parenthetically, is the last time history mentions the Council of the Russian Republic…. Then followed the customary string of delegates from the Ministries, the Vikzhel, the Union of Posts and Telegraphs, for the hundredth time reiterating their determination not to work for the Bolshevik usurpers. A yunker who had been in the Winter Palace told a highly-coloured tale of the heroism of himself and his comrades, and disgraceful conduct of the Red Guards—all of which was devoutly believed. Somebody read aloud an account in the Socialist Revolutionary paper Narod, which stated that five hundred million rubles’ worth of damage had been done in the Winter Palace, and describing in great detail the loot and breakage. From time to time couriers came from the telephone with news. The four Socialist Ministers had been released from prison. Krylenko had gone to Peter-Paul to tell Admiral Verderevsky that the Ministry of Marine was deserted, and to beg him, for the sake of Russia, to take charge under the authority of the Council of People’s Commissars; and the old seaman had consented…. Kerensky was advancing north from Gatchina, the Bolshevik garrisons falling back before him. Smolny had issued another decree, enlarging the powers of the City Dumas to deal with food supplies. This last piece of insolence caused an outburst of fury. He, Lenin, the usurper, the tyrant, whose Commissars had seized the Municipal garage, entered the Municipal ware houses, were interfering with the Supply Committees and the distribution of food—he presumed to define the limits of power of the free, independent, autonomous City Government! One member, shaking his fist, moved to cut off the food of the city if the Bolsheviki dared to interfere with the Supply Committees…. Another, representative of the Special Supply Committee, reported that the food situation was very grave, and asked that emissaries be sent out to hasten food trains. Diedonenko announced dramatically that the garrison was wavering. The Semionovsky regiment had already decided to submit to the orders of the Socialist Revolutionary party; the crews of the torpedo-boats on the Neva were shaky. Seven members were at once appointed to continue the propaganda…. Then the old Mayor stepped into the tribune: “Comrades and citizens! I have just learned that the prisoners in Peter Paul are in danger. Fourteen yunkers of the Pavlovsk school have been stripped and tortured by the Bolshevik guards. One has gone mad. They are threatening to lynch the Ministers!” There was a whirlwind of indignation and horror, which only grew more violent when a stocky little woman dressed in grey demanded the floor, and lifted up her hard, metallic voice. This was Vera Slutskaya, veteran revolutionist and Bolshevik member of the Duma. A commission composed of members of all parties was immediately appointed, and with the Mayor, sent to Peter Paul to investigate. As we followed them out, the Duma was appointing another commission to meet Kerensky—to try and avoid bloodshed when he entered the capital…. To the representative of the American Socialist press, JOHN REED, to visit all places of confinement in the cities of Petrograd and Cronstadt, for the purpose of generally investigating the condition of the prisoners, and for thorough social information for the purpose of stopping the flood of newspaper lies against demorcracy. On the left loomed the low dark outline of Trubetskoi Bastion, that living grave in which so many martyrs of liberty had lost their lives or their reason in the days of the Tsar, where the Provisional Government had in turn shut up the Ministers of the Tsar, and now the Bolsheviki had shut up the Ministers of the Provisional Government. A friendly sailor led us to the office of the commandant, in a little house near the Mint. Half a dozen Red Guards, sailors and soldiers were sitting around a hot room full of smoke, in which a samovar steamed cheerfully. They welcomed us with great cordiality, offering tea. The commandant was not in; he was escorting a commission of “sabotazhniki” (sabotageurs) from the City Duma, who insisted that the yunkers were all being murdered. This seemed to amuse them very much. At one side of the room sat a bald-headed, dissipated-looking little man in a frock-coat and a rich fur coat, biting his moustache and staring around him like a cornered rat. He had just been arrested. Somebody said, glancing carelessly at him, that he was a Minister or something…. The little man didn’t seem to hear it; he was evidently terrified, although the occupants of the room showed no animosity whatever toward him. A praporshtchik of the Pavlovsky regiment was telling us how the insurrection started. “The polk (regiment) was on duty at the General Staff the night of the 6th. Some of my comrades and I were standing guard; Ivan Pavlovitch and another man—I don’t remember his name—well, they hid behind the window-curtains in the room where the Staff was having a meeting, and they heard a great many things. For example, they heard orders to bring the Gatchina yunkers to Petrograd by night, and an order for the Cossacks to be ready to march in the morning…. The principal points in the city were to be occupied before dawn. Then there was the business of opening the bridges. But when they began to talk about surrounding Smolny, then Ivan Pavlovitch couldn’t stand it any longer. That minute there was a good deal of coming and going, so he slipped out and came down to the guard-room,leaving the other comrade to pick up what he could. “I was already suspicious that something was going on. Automobiles full of officers kept coming, and all the Ministers were there. Ivan Pavlovitch told me what he had heard. It was half-past two in the morning. The secretary of the regimental Committee was there, so we told him and asked what to do. Just then the commandant entered—a merry-looking young non-commissioned officer with his arm in a sling, and deep circles of sleeplessness under his eyes. His eye fell first on the prisoner, who at once began to explain. “No,” said the young soldier, irritably. “I am not going to disturb the prisoners again. I have just been compelled to wake them up—they were sure we were going to massacre them…. Most of the yunkers have been released anyway, and the rest will go out to-morrow.” He turned abruptly away. The Commandant, who was pouring himself a glass of tea, nodded. “They are still out in the hall,” he said carelessly. Indeed they stood there just outside the door, in the feeble light of an oil lamp, grouped around the Mayor and talking excitedly. He turned to us his face of venerable dignity. Up the Nevsky, in the empty after-midnight gloom, an interminable column of soldiers shuffled in silence—to battle with Kerensky. In dim back streets automobiles without lights flitted to and fro, and there was furtive activity in Fontanka 6, headquarters of the Peasants’ Soviet, in a certain apartment of a huge building on the Nevsky, and in the Injinierny Zamok (School of Engineers); the Duma was illuminated…. In Smolny Institute the Military Revolutionary Committee flashed baleful fire, pounding like an over-loaded dynamo…. Appeals And Denunciations Appeal to all Citizens and to the Military Organisations of the Socialist Revolutionary Party. “The senseless attempt of the Bolsheviki is on the eve of complete failure. The garrison is disaffected…. The Ministries are idle, bread is lacking. All factions except a handful of Bolsheviki have left the Congress of Soviets. The Bolsheviki are alone! Abuses of all sorts, acts of vandalism and pillage, the bombardment of the Winter Palace, arbitrary arrests—all these crimes committed by the Bolsheviki have aroused against them the resentment of the majority of the sailors and soldiers. The Tsentroflot refuses to submit to the orders of the Bolsheviki…. The Military Section of the Central Committee of the Socialist Revolutionary Party. “A usurper, whose place is in Peter-Paul prison, with Kornilov and Kishkin. “A criminal and a traitor to the workers, soldiers and peasants, who believed in him. “Kerensky? A murderer of soldiers! “Kerensky? A public executioner of peasants! “Kerensky? A strangler of workers!